Home» Products» CHRISTO-LUBE MCG-111 OXYGEN O RING LUBE 5g SQUEEZE TUBE Lowest Cots on the Web!! CHRISTO-LUBE MCG-111 OXYGEN O RING LUBE 5g SQUEEZE TUBE Lowest Cots on the Web!! 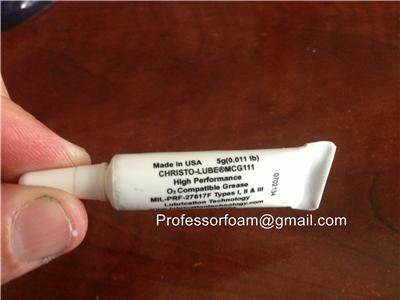 Up for sale is one 5 gram (0.011 pound net weight) squeeze tube of genuine Christo-Lube® MCG-111. This a re-usable tube with a twist cap - not the single use "tear-off" one. This lubricant is well known in the scuba world because of its inert properties to oxygen. Now you can get this premium lubrication in a small package at a great price! MCG-111 is a chemically inert, oxygen compatible PFPE grease lubricant. It has an operating temperature range of -100F to 450F. Uses for CHRISTO-LUBE® MCG 111 include all types of life support systems, including open and closed circuit diving, aviation oxygen, hyperbaric chambers and medical gas regulators. Other uses for MCG 111 include instrumentation, pneumatic cylinders and electrical contacts and switches. CHRISTO-LUBE® MCG 111 is qualified to MIL-PRF-27617F, Types I, II, and III. Offers for $5.98 will be accepted for 3 tubes or more.